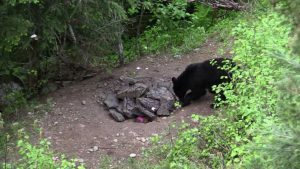 Black bear hunting can be one of the best experiences of your life. However, you need to know bears, their body language, and their habits before you go off on your hunting trip. Most often, though, you will need to listen to your guide in the wilderness, as they are often the experts on bears. When you are black bear hunting, ask your guide if you are unsure if a bear is of proper size and age before aiming. Taking a smaller, younger animal can have dire consequences. Smaller bears are young adults and would be about ready to breed. The size and age you want is larger and considerably older. To the untrained eye, and knowing that black bears are smaller, you might accidentally mistake a cub for an adult bear. If you are out hunting, you should be aware that black bears have longer back legs than most bears. They have small eyes, large body, rounded ears, long snout, and a short tail. Their sense of smell is sensitive. They can walk on their hind legs, though prefer to walk on all fours. They also have a lumbering gait because they walk flat-footed. They are bigger in the fall as their bodies prepare them for hibernation. Be prepared, when hunting for black bear, for rough terrain and cold nights. 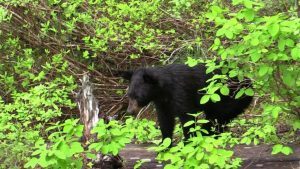 Black bears tend to live in shrubby and forested areas, but also roam the wet meadows, ridge tops, high tidelands, riparian areas, burned areas, avalanche chutes, agricultural fields, conifer forests, and swampy hardwood. This is where your bear will likely be found. Black bear hunting is strictly controlled because of the low reproductive rate of the females. Hunting permits and licenses may be harder to get at certain times of the year, so apply early to save some time and frustration. If you are hunting a black bear, you will want to learn how to read bear body language. Knowing that a bear can stand on its hind legs sniffing the air is not necessarily an aggressive posture and ultimately being aware that it could drop to all fours and charge you at any moment is knowledge well learned. Learn the other signs of aggression and be careful. Keep in mind that in the last century, there were only fifty-six confirmed cases of black bears were killing humans. Learning as much as you can about black bear hunting will only enhance your trip and make it one of your most memorable ones. Knowing you took down a bear will be exhilarating and will have people admiring you.